2 Level 4 monsters Once per turn, during your Standby Phase, detach 1 material from this card. If you cannot, destroy it. This Attack Position card cannot be destroyed by your opponent’s card effects. Your opponent cannot target this Attack Position card with card effects. While this card is in face-up Defense Position, change all face-up monsters on the field to Defense Position, also negate the activated effects of monsters that were in Defense Position when that effect was activated. Number 41: Bagooska the Terribly Tired Tapir is our #1 card out of Circuit Break, and I think this is a great choice. Generic Rank 4, able to be used by anyone running some Level 4 monsters, and controlling depending on how you use him. In ATK mode, Bagooska has protection against opponent destruction card effects. Mirror Force, Dark Hole, Raigeki, they mean nothing to this Tapir when he’s attacking. Not only that, he can’t be targeted in ATK mode by card effects, lending even more protection against things that wouldn’t destroy him, but would stop him like Book of Moon. In DEF, he’s negating all face-up monsters effects and performing a Zero Gravity on them. Tapir locks out opponent effect monsters from activating their effects on the field, slowing the duel and restricting your opponents plays. After two turns with Bagooska on the field you’ll likely run out of Xyz materials to detach and it will be destroyed, but two turns should be enough for you to take control with a Skill Drain and Zero Gravity with this card in DEF. Both effects are fantastic and can swing a game in your favor. 2100ATK is lower than some Rank 4 monsters, but the ease of summoning, combined with the insane protection and control this Tapir has to it, it’s no question why he’s #1 in the set. One of the best Rank 4 monsters in the game, and with Link Summoning the big thing now, Bagooska reminds us that Xyz Summoning is still here. Number 41 is number 1 of the set. Bagooska the Terribly Tired Tapir is a Rank 4 Earth Fiend-type XYZ Monster with 2100 Atk and 2000 Def. It’s nice and generic, only requiring 2 Level 4 monsters to properly XYZ Summon. It also destroys itself during your Standby Phase if you can’t detach a material from Bagooska. While in Attack Position, it can’t be targeted or destroyed by the opponent’s effects. While in Defense Position, it changes all other face-up monsters to defense position and negates monster effects from if the monster activated the effect while it is in defense position. Great protection in Atk mode but with mediocre attack. Great disruption effect in Def mode, but it effects both sides of the field. So it’s not perfect, but I love the play on words. The timing of this release is good because Link Monsters can’t exist in Def mode. 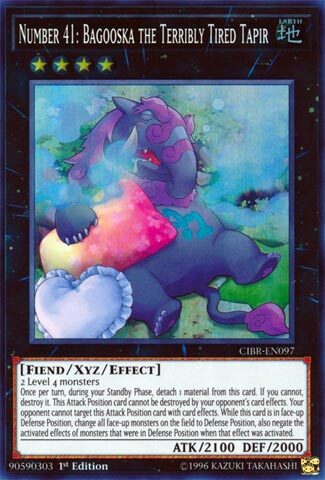 So if you Link first and then XYZ Summon this in Def mode during turn one, your opponent’s monsters will have a hard time doing much of anything. Not my favorite card in the set, but worth running if you can XYZ Rank 4 monsters, which was always a toolbox Rank anyway. Score: 4/5 Art: 4/5 Good art, but I don’t want to look at it. And finally we get to the #1 of Circuit Break, and just like how we started, we end with a card that probably should of been in Battles of Legend, Number 41: Bagooska the Terribly Tired Tapir. Number 41: Bagooska the Terribly Tired Tapir is the #1 card from this set. Look at the beautiful picture and the use of color here. Simply amazing. So let’s see, we have a generically summoned Rank 4, who requires the discard of an XYZ Material, or else he destroys himself. 2100 attack and 2000 defense on Rank 4 is meh, but with his effect, it’s not really a problem at all. While in attack mode, this card can’t be targeted or destroyed by your opponent’s card effects. While in defense position, all face-up Monsters are changed to defense position and activated effects of said Monsters are negated when this effect is activated. This card can certainly be a headache to play against, for obvious reasons. It’s rare to see so many prime factors in one card. Here, you have massive protection, as well as field control, attached to how easily summoned this can be, a great card to be sure.